I met Paul, owner of Manorview Historic Consulting and Reproductions, at Siena College while teaching one of my photography classes. He was there at the Day of Living History, a program where reenactors showcase their historic and sometimes authentic items while dressing the part. 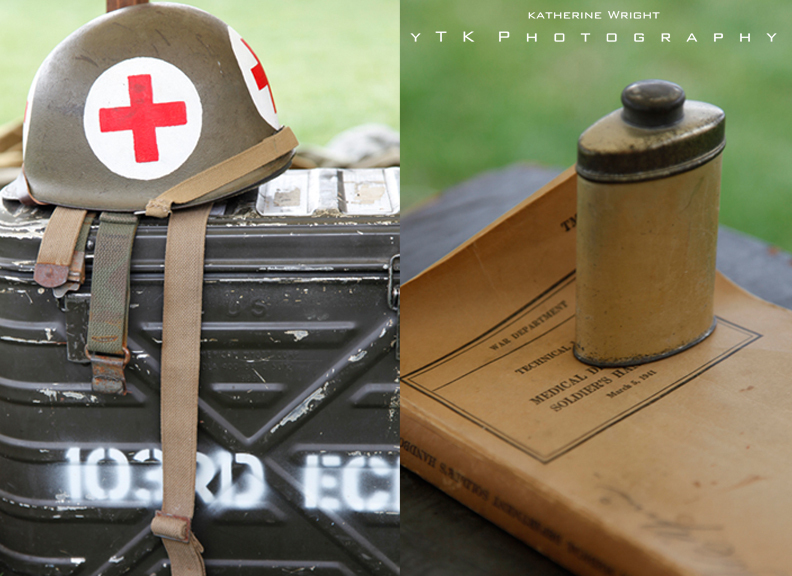 As pictured, Paul is a Medic from the 103rd Medical Battalion from World War II. Growing up in a family with two very active (and destructive) little brothers – I am no stranger to blood and injuries. One of my most vivid childhood memories was of my brother falling on the salt spreader and slicing his lip open – it needed stitches. Mom, a Nurse and Dad and ED Doc, put together a medical bed on the kitchen table and stitched him right up. “Work quickly and with what you got”. In seeing some of the supplies that Paul brought along, it made me think about the limited resources that they had at that time and how this is still the case today in far too many places around the world. Just like my parents, innovation and the ability to work with what you have is an invaluable skill all on it’s own. To fit the time period, I antiqued the portraits of Paul by using NIK silver effects pro– and adding some grain. I adore vintage photography and look forward to expanding with more work like this over the summer.